God has commanded us to repair the broken lives of many people (Isaiah 58). Challenging, yet rewarding, it can only be done with the help of the Holy Spirit. Otherwise, we would be spinning our wheels and circling the wagons. As I try to live out His command, I’m reminded of the nursery rhyme, Humpty Dumpty. According to it, “Humpty Dumpty sat on a wall, Humpty Dumpty had a great fall. All the kings horses and all the king’s men couldn’t put Humpty together again.” Metaphorically, we are the King’s horses and the King’s men. Even with all of our efforts, we cannot rebuild the ruins of others’ lives without the help of Jesus Christ. In the Bible, Nehemiah, troubled by the devastation of Jerusalem, weeps and mourns. After praying and fasting, he repents of his sins, and asks for favor in the presence of the King so that he could rebuild the walls of Jerusalem. Nehemiah acknowledges that the hand of the Lord is upon him. Everybody in the community helps in the rebuilding. No one person has the entire responsibility; however, opposition is at every corner waiting to discourage the work. During the rebuilding, the Lord uses Nehemiah mightily as he helps out the impoverished and requests help from the Lord while still enduring constant opposition. After the successful rebuilding, Nehemiah’s enemies hear of his success. The Bible says in Nehemiah 6: 16, that the surrounding nations were afraid and lost their self-confidence, because they realized that this work had been done with the help of our God. We believers must acknowledge our limitations, knowing that our help comes from the Lord. Some of our requests will be answered only with the help of the Holy Spirit. Confessing our sins and humbling ourselves will yield positive results. God will never allow anyone to steal His glory. The Lord says in Jeremiah 9:24, “Let not the wise boast of their wisdom or the strong boast of their strength or the rich boast of their riches, but let the one who boasts boast about this: that they have the understanding to know me, that I am the Lord, who exercises kindness, justice and righteousness on earth, for in these I delight,” declares the Lord. Let’s be patient as God completes His work in us and through us. The process that God takes us through is just as important as the end result. Thus, let’s glory in the Lord and not in ourselves. Who is your “ruin?” Whose life is God using you to repair? Do not give up. Remember, God works out everything according to the counsel of His own will (Ephesians 1:11). Let’s pray together believing that God will use us to bless lives through restoration and renewal. For further meditation and reflection: read Nehemiah 4:1-6; Nehemiah 5:14-19; Zechariah 4:6; Isaiah 58: 5-12. The Bible, via the Apostle Paul, in Phillipians says rejoice in the Lord always and again I say rejoice. During our lifetimes many of us have had difficulties, seasons of despair when all seems hopeless. Just know that Jesus still hears and answers prayer. This season may be difficult for some of us, but God wants us to be thankful for all of the blessings He has bestowed upon us. How can we ever be helpful to others if we have never suffered either difficulties or traumatic events? Not to minimize these events, but God is calling us to His son. He wants us to call upon Him in the day of trouble and to know that he is near. During this Thanksgiving season many of us are grateful for good health, for employment, and for our families. Many of us, however, have deep seated hurts and anguish that keep us from moving forward. God, in His word gives us the tools to work through these daunting circumstances. The Bible, in Phillipians 4:6, says for us to be anxious for nothing, but in everything by prayer and supplication to make our requests known to God so that the peace of God which passes all understanding will guard our hearts and minds in Christ Jesus. We must focus on those things which are excellent and praiseworthy. Let’s look forward to those things which lie ahead. I am reminded of an old hymn that says “Have a little talk with Jesus/ tell Him all about your troubles /He will hear our fainted cry/ He will answer by and by/ feel a little prayer wheel turning/ will know a little fire is burnin’/ you will find a little talk with Jesus makes it right.” Jesus just wants us to come to Him and He will give us rest for our weary souls. King David, in Psalm 7:8 says, My heart has heard you say, “Come and talk with me.” And my heart responds, “Lord, I am coming.” Thus, during this Thanksgiving season, have a conversation with Jesus. He will heal all wounds because He is the friend of a wounded heart. If everything is well, show Him your gratitude. If it is not, tell Him all about it, and he promises to give you rest for your weary soul. I pray that God will strengthen you with endurance and patience to run your given race. Have you ever found it difficult to surround yourself with those who are most unlike you? Do you secretly disdain others who have attributes that you find distasteful? Sometimes we hold in contempt those who do not have the best clothing, those who are homeless, obese, uneducated and more. I want to challenge all of us (including myself), to reach down deeply within our hearts and recognize that we are what others may not like. We all have traits that rankle others, have all been in circumstances of which we are not proud, and have behaviors that others disparage, yet Jesus Christ loves us in spite of our shortcomings. He died for the sins of the entire world, not just for those of us who present ourselves well (or at least we believe that we do). All of us can see the plank in our sisters’ eyes, but not in our own. If Jesus had not surrounded himself with sinners, how would the gospel have reached us? 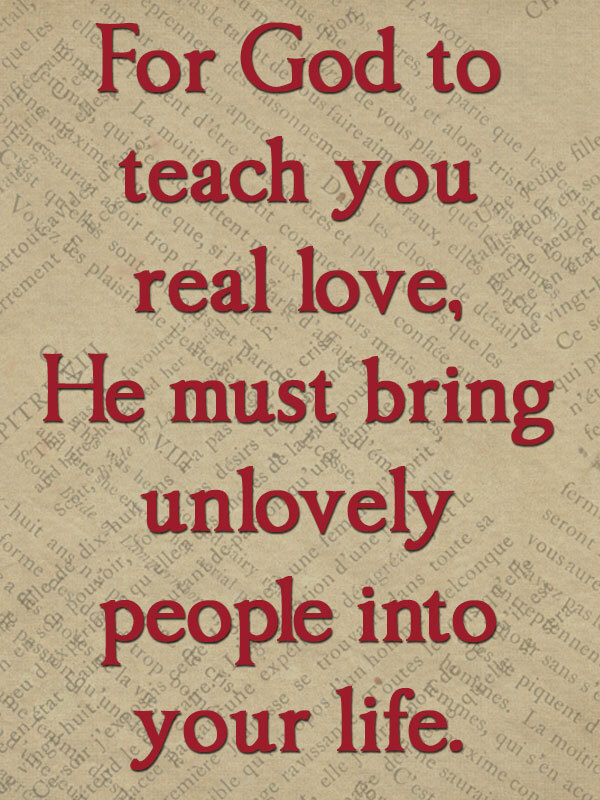 Let’s humble ourselves under God’s mighty hand, and befriend those who have unlovely behaviors. It is difficult, but someone befriended us (like Christ) and overlooked our faults so that our needs could be met. How many people do we come in contact with who are hurting and may not know the gospel of Jesus Christ? The Bible tells us to go into all the world to preach the gospel. When we go into the world, we must also be willing, if able, to meet the needs of those to whom we are ministering. We cannot preach the gospel to someone, see that he has no food to eat, and not help him meet his basic need. In the book of James, we learn that faith without works is dead. The Bible commands us in Isaiah 58: 6-12 to share our food with the hungry, to give shelter to the homeless, to give clothes to the needy, and to help our relatives. God promises us that if we look after those in need, by loving them, we will be like a well-watered garden, like an ever-flowing spring. We love others because He has commanded us, and because He first loved us. Let’s show love to someone who seems unlovely, and watch to see God use us to rebuild broken down ruins. Let’s ask the Holy Spirit to fill us with the knowledge of His will to equip us to carry out this task. May God bless us in all of these endeavors. Remember, we are fishers of men.